Burleighs Gin Distillery Tour, Leicestershire. It's not every day you are invited along to have a tour of a Gin distillery. I'm a huge fan of Gin and Tonic, I'm always ready to try out the best of the best out there and add it to my growing collection in our kitchen. I would also like to think that over the years I've managed to convert quite a few friends and family to enjoy the tipple too. Little did I know until recently that a Gin Distillery was only minutes from where I live, perfect. But why hadn't I realised this sooner? 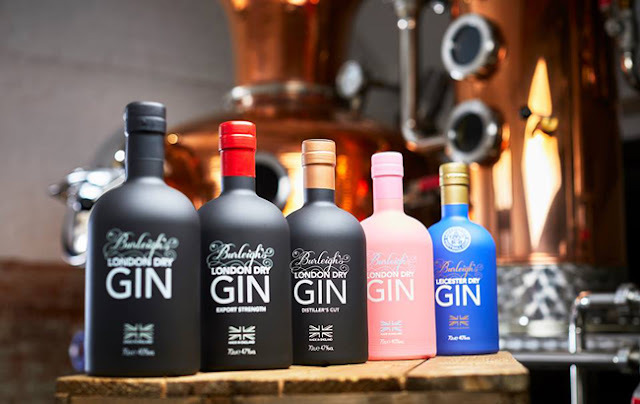 Leicester's very own Gin masters Burleighs have recently begun giving customers and gin lovers the opportunity to see how a distillery works. The team unveiled some of the secrets of the industry as well as showcase the craftsmanship and passion that goes into creating every bottle of Burleighs Gin. The Gin has grown in popularity particularly in Leicester's 45 West Bottle Shop and Bar. If you are a fan of the tipple then it's the perfect time to get some understanding of what goes into making Gin. What's even better is the finding out about the variations of flavours to make some of your most favourite combinations. The distillery itself is situated deep within the beautiful surroundings of Charnwood Forest. It also sits alongside one of Leicestershire's popular wedding venues, Bawdon Lodge Farm. The surroundings of the beautiful countryside have provided Burleighs Gin master distiller, Jamie Baxtor, with tons of inspiration behind the recipe right on his doorstep. Little did we know until the tour that a lot of its ingredients were sourced from the Burleigh woods that are adjacent to the distillery. Jamie came across the likes of silver birch, dandelion, burdock, elderberry and iris. These unique botanicals are the inspirations behind the first recipe of gin made in the distillery and it is this woods alone that gave the gin its title name of Burleighs. The gin is distilled from their copper pot 'Messy Bessy'. This 450-litre copper pot still has been custom designed to ensure that sourcing great ingredients and the mechanisms of the distiller achieve the result of creating the best flavours of Burleighs Gin. It's design and structure is amazing in itself, and getting a feel for how they get the best through the entire process ensures that there is little waste as possible produced. There is real heart at the centre of Burleighs Gin, particularly as each bottle is handcrafted from beginning to end. So whether that's sourcing the ingredients to filling and sealing, its all done by the hands of the team. There are 5 Gin's available in their range, we got to sample these during our tour. Burleighs Signature London Dry Gin 40% ABV - I enjoyed sipping on this with tonic and a slice of orange when we arrived, a real classic gin with 11 carefully selected botanicals including silver birch, dandelion, burdock and elderberries. It has a real smooth, crisp and fresh flavour to it. Burleighs Export Strength Gin 47% ABV - This gin is distilled to the same botanical recipe at their signature gin. This gin has a higher ABV making it great for a cocktail or if you wanted a stronger flavoured gin and tonic, whatever your preference is. Burleighs Distiller Cut Gin 47% ABV - This gin is delicious! It's a crisp and fresh gin that showcases the Master Distiller's Craft in a bottle. The same 11 botanicals are used for this one but in a different radio to give it more of a softer, sweeter and floral tone. It would be suited for cocktails or in a gin and tonic, garnished with pink grapefruit and a sprig of rosemary. Burleighs Pink Edition 40% ABV - If I am honest this was probably the gin that I least enjoyed in the evening. It's a floral, sweet gin inspired by Tokyo. It has flavours of Japanese cherry blossom, hibiscus, rose and pink grapefruit added to the original London Dry recipe of Burleighs. For me its flavour just didn't suit my preference, therefore probably wouldn't be something I'd drink again. Burleighs Leicester Dry Gin (LCFC Edition) 40% ABV - This gin was a real surprise for me. It's inspired by the achievements of Leicester City Football Club a couple of years ago but also a celebration of our heritage. The botanicals and flavours are taken from the history of Leicestershire food and drink. There are flavours of thyme, sage, nutmeg and mace. It's not what I expected at all. It's got a real warming flavour and feels to it once it hits your palate and I definitely could enjoy this with a dinner. The knowledgeable and clearly passionate members of the team made the tour such an enjoyable experience. The duration is around 1.5hours which I think is good enough time to gain some new knowledge, have a look around the distillery and of course, try out some of the gins yourself. I enjoyed finding out more about their history, particularly how they sourced some of their ingredients. It felt inspiring to understand how two people work as a collective to create some delicious gin within my hometown of Leicestershire. I'll definitely be taking the full advantage of the distillery and booking for myself and some of the blogging girls to attend a Gin School in the New Year. For the price of £20.00 each, the tour includes a welcome drink of their signature Burleighs London Dry Gin and tonic, a full distillery tour, a tasting of the Burleighs range and even a £5.00 discount voucher for bottle purchases made on the day. You should definitely grab your favourite Gin friends and family for this one! *Invited by Burleighs Gin to attend a Distillery Tour in return for an honest revirew, enjoy.